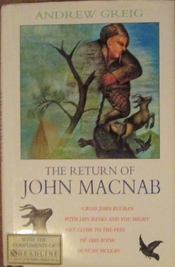 Headline Review, 1996, 285 p.
This, Greig’s second novel, takes as its template John Buchan’s John Macnab which I reviewed here. Once again three men – but this time not “gentlemen” – form an alliance to poach a salmon, a brace of grouse and a stag respectively from three different estates, Mavor, Inchallian and Balmoral, and then deliver the poached items back to the “owners”, as a challenge to “absentee landowners and the Criminal Justice Act” and as a wager to the three estates’ owners; issuing a statement to this effect in the Scotsman newspaper. The “John Macnab” here comprises at first Neil Lindores, Murray Hamilton and Alasdair Sutherland, each with his own special talent useful for the enterprise, but not long after arriving in “a small Highland town” Lindores is sussed out by local journalist Kirsty Fowler who is excited by the project and offers to help them. The big problem John Macnab faces here is Balmoral. It is late summer and HRH is in residence. Consequently the place is hoaching with Special Services, Army and Police as well as the usual ghillies and gamekeepers. The authorities cannot ignore the possibility that John Macnab is merely a cover for a terrorist attempt on HRH’s life. The text occasionally refers to Buchan’s novel, as it has to, and even critiques it in mentioning that Buchan’s women are really just chaps – though with (small) breasts. Greig’s intent is somewhat different; and his women are certainly far from chaps. Kirsty is as rounded and complex a character as you could wish (such women are a common factor in Greig’s novels) and is thoroughly involved in the poaching efforts – as are Sutherland’s and Hamilton’s wives and the former’s family – at least in the second one. Sutherland’s wife, though she has had an affair tells Kirsty she would kill him if he were to do the same. Ellen Stobo, a policewoman attached to the security services but who finds herself coming to an understanding of John Macnab, is also well drawn. To be fair to Buchan he was writing adventure tales for a male audience in a time that was less aware. Greig is by far the better examiner of the human condition though. The John Macnab template – while driving the events of the plot – at times gets in the way of Greig’s greater facility with personal relationships but in the end his own concerns overwhelm Buchan’s. Still, he nearly overdoes it, veering very close to the tradition of the Scottish sentimental novel (compare Iain Banks’s Espedair Street,) in the final pages. But he is too canny to yield a conventional ending. That template means that The Return of John Macnab is not quite up there with Greig’s best – all the other novels of his I have read; see “Andrew Greig” in my categories – but for an exploration of human uncertainties, hesitations, lust for life and willingness to take risks, emotional as well as physical, it’s still pretty damn good. Pedant’s corner:- midgies (midges – which spelling does occur in the book once but otherwise with the extraneous “i”,) swopped (swapped,) “‘but there a problem comes with it’” (but there’s a problem,) autogiro (autogyro,) hoochin’ (usually spelled – and pronounced – hoachin’,) the main work party were loading gear (the party was,) none of the computer systems were down (none was down,) a missing end quote mark.